For a teacher, it’s pretty easy to focus on improving students—that’s our job, right? So when I learned about Carol Dweck’s theory of growth mindset, my first thought was about how I could get my students onboard with this idea. And then I realized that if I were to better my own craft, I would have to take on the challenge for myself as well. I think that I succeed as a teacher because I’m willing to mess up often and mess up big. And yet, I also take any excuse to avoid pushing myself to grow. Having a growth mindset doesn’t just mean learning about the theory and leaving it at that. It’s a constant process. Sometimes it’s difficult, often it’s a little painful, but it’s always worth the effort. Focus on the hard stuff. I remember early on in my teaching career realizing that while I was doing a pretty good job getting students to read and discuss literature, I was not really teaching them writing. So I decided to schedule the block day in our week as a writing day. Ten years and thousands of pages of creative writing later, I still had not successfully taught my students to write a research paper, so I blocked out three full weeks in our schedule to work through the process from beginning to end. Rather than focus on what I know is humming along fine, I look for the weaknesses. Usually, these are the areas that don’t come naturally, or that I don’t like very much myself. (And I still sort of despise research papers.) But when I focus on the hard stuff, I am a providing a much better learning experience for my students. Try innovative solutions, and if they don’t work, try some more. I have tried some crazy things as a teacher. Some I realized were flops immediately, while some I pushed through for months before admitting that they weren’t working out. But some of those innovations have saved my sanity, and I would never have tried them if I had been afraid to fail. Again, I think the key here is to focus on the weaknesses, on the stuff that is not going well. It’s fun to tweak assignments that are already a hit, but when I focus on my most nagging problems, I make my biggest breakthroughs. Seek feedback wherever you can. 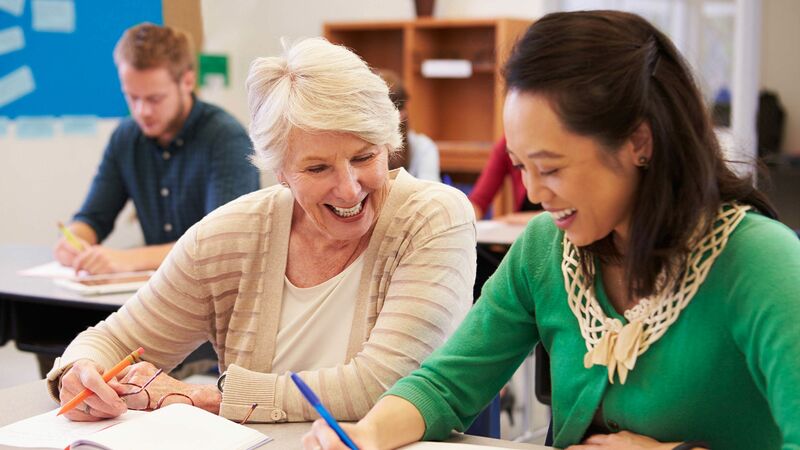 Evaluations don’t have to come from administrators— they can come from fellow teachers or even the students. When I switched schools about 12 years ago, I was having an especially hard time dealing with some of my new students. So a colleague came in one day and wrote down everything that was said or done during an entire class. No comments, no suggestions, and no filter. It was brutal to be confronted with that reality, but it also gave me a lot of insight into what I was missing from the front of the room. Two years ago, when a group play project went really badly for some of my classes, I took a whole day to get student feedback on the event. Through reflection questions and some writing, I figured out what was going on behind that disastrous cooperative project. Know that you are always developing your skills. I often say that I consider myself to be a B+ teacher. Maybe I’ll be an A- teacher one day. Giving myself permission to be good now means that I don’t wait until I’m perfect to try something new. Reflect at the end of every day, especially the bad ones. I have learned a lot from my toughest students and my biggest lesson plan flops—but only because I reflect on what went wrong. If I were to write those students and lesson plans off as not my fault, I would never learn from experience. Sometimes one kid has a bad day, but the truth is that when the lesson goes badly for the entire class, it’s probably something that I did wrong. Notice the areas where you have a fixed mindset. It’s easy to think that there are some areas of teaching that I’m just not good at, but I know that’s an excuse I use when things get hard. Reflecting on my attitude and how it affects my willingness to grow is always useful. I can’t have a growth mindset about everything all the time, but I can notice when I’m talking myself out of trying something because I’m afraid.